When Eden was ten years old she found her father, David, bleeding out on the bathroom floor. The suicide attempt led to her parents’ divorce, and David all but vanished from Eden’s life. Since childhood, she has heard from him only rarely, just enough to know he’s been living on the streets and struggling with mental illness. But lately, there has been no word at all. Now in her thirties, Eden decides to go look for her father, so she can forgive him at last, and finally move forward. When her search uncovers other painful truths—not only the secrets her mother has kept from her, but also the agonizing question of whether David, after all these years, even wants to be found—Eden is forced to decide just how far she’ll go in the name of love. My thoughts about Outside The Lines: Rarely do I comment about titles of books, but I have to commend whoever named this book! 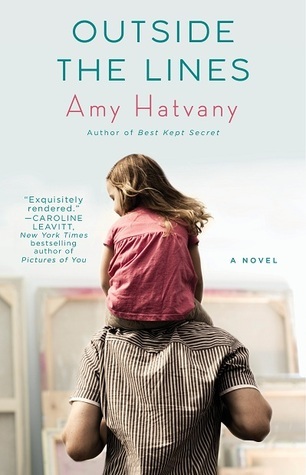 Author Amy Hatvany's story of Eden, her father David and her mother is a heart breaking saga of discovery, truth and pain that really does exist "outside the lines." This is a remarkable story told in an amazing manner. Mental illness, and the repercussions that come to the families affected by the symptoms and realities of a mentally unbalanced family member are hard for to me to read from a personal viewpoint. What moved me the most is the remarkable way Hatvany switched from character to character, with different voices and also different time lines so seamlessly that the reader never losses focus so the reader easily follows the story that Hatvany is telling. As Eden literally uncovers, layer by layer, the truths and lies and distortions that occurred in her family, she moves forward in her search to get the answers that have been haunting her all her life. Perhaps Eden's biggest leap of faith comes when she meets David in the homeless shelter where she volunteers. Can she develop a relationship that's grounded? Can she trust? In the end, will the truth complete her? I can't recommend Outside The Lines enough. It's a well crafted, heartwarming story of one woman's struggle to step "outside the lines," to work through the scars of the past, and one day triumph. Hatvany did a brilliant job showing how the effects of one unstable person can permanently affect everyone in their world. ** This book was provided to my by the publisher, and that in no way affected my honest opinion of this book.